My friend Erika was celebrating her birthday today and I wanted to make her something delicious and pretty. Cupcakes always seem to bring a smile to people’s faces and are fairly easy enough to make that even I can do them. My next pantry project is to use up the huge container of poppy seeds I bought two years ago when I needed just a pinch to garnish scallop carpaccio. I love lemon poppy seed cake so I decided to do a cupcake version of it. Meringue frosting would add a unique twist to it and look beautiful. Then I thought why not stuff it with lemon curd? 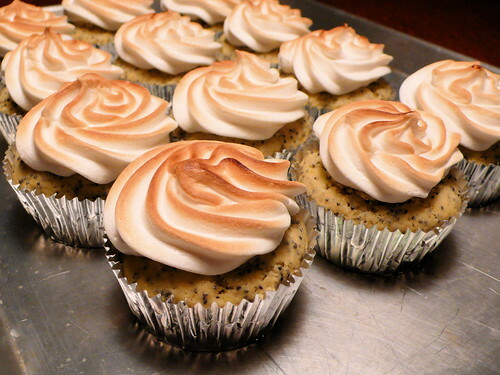 In the end this cupcake became a perfect smashup of lemon poppy seed cake and lemon meringue tart. I used Joy of Baking’s vanilla cupcake recipe as the foundation and added the bright lemon flavor to it. The lemon curd was store bought to save some sanity on my part. I had a little taster of the cupcake and it was delicious! I loved the lemon flavor of course and the crunchy poppy seeds added a great texture and also a nice visual effect once the cupcake liner was peeled off prior to devouring. But he toasted meringue frosting was the cherry on top though. Aerated, glossy, and nicely browned just on the edges. In a mixer cream sugar, butter and lemon zest. Add eggs one by one until incorporated. In another bowl whisk flour, baking powder, poppy seeds and salt. Add half of the dry mix, then buttermilk, then remaining dry mix and lemon juice. Mix just until the ingredients are incorporated. Line cupcake pan and divide batter evenly. Bake for 18-20 minutes and then cool on a rack. Once cupcakes are completely cool stuff each cupcake with a generous teaspoon of lemon curd. I used the cone method from Cupcake Bakeshop by the talented Chockylit. Now make the meringue by beating the egg whites. When it gets foamy add cream of tartar and slowly start adding the sugar. Beat until hard peaks. Use your favorite piping tip to apply the meringue to the cupcake. I used a #4 open star tip and then broiled it just enough to get the ridges nicely toasted. Ooh–broiling the meringue adds a nice effect! i’ve always loved the browned ridges on a lemon meringue pie or tart. biting into these was like a poppy field of dreams in my mouth and clouds on my lips. amazingly delicious and beautiful. just like yoony herself.